Welcome to Last Chance Handgunner’s Cowboy Action Shooting. 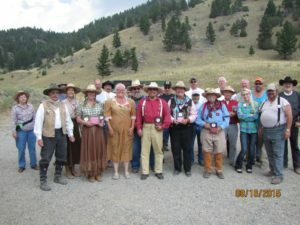 Beginning in 1989, The Last Chance Handgunner’s was the first Single Action Shooting Society (SASS) Cowboy Action Shooting affiliated club in Western Montana. The basics of Cowboy Action Shooting are: you dress up in old west period clothing, shoot old west period guns (i.e. ; original or replica single action revolvers, lever action rifles and pump or side by side shotgun models prior to 1897), and have old west FUN. New shooters are encouraged to come down and participate in a match and spectators are always welcome. All shooters and spectators are required to wear safety glasses and hearing protection. Monthly matches will typically have no more than five stages. On each stage you will use 10 rifle rounds, 10 pistol rounds, and 4+ shotgun rounds on steel targets of various shapes and sizes. Shooter’s fees are $10.00 at the monthly matches and as ALWAYS 17 years old and under shoot for free. We shoot at the Last Chance Handgunners facility near Boulder, MT (see ABOUT US for directions to the range). Unless otherwise noted the gate opens at 8:00 AM with registration beginning at 9:00 AM. The shooter’s safety meeting (safety first, last and always) will be just prior to slinging lead down range by 10:00 AM, a lunch break about noon (you provide), tear down of stages after shooting is complete, and results. All shooters and spectators are required to wear safety glasses and hearing protection.